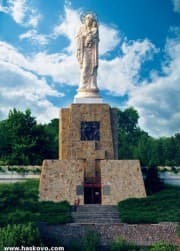 Haskovo is a tidy, friendly and very interesting city, his emblem became the monument of Mother and Child, which is the patroness of the city. Spread on a rolling plain between two majestic mountains of the Balkan and Rhodope Mountains, passing through it a number of international transport corridors. 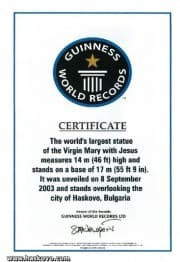 With Monument "Virgin Mary" Haskovo enter Guinness Book of Records in 2005 under "Religion" because of his impressive height, was declared the highest statue in the world of the Virgin and Child. For this prestigious award has been issued its marble footprint of the monument is placed. The sculpture is 14 meters high and weighs 80 tons, was placed on 17-meter pedestal, inside the chapel is formed. It crowns the hill "Yamacha" aka Junior hill made of polymer-concrete and visible from throughout the city. The idea to make this monument came from the then mayor Georgi Ivanov, the execution is taken by a team led by builders Petyo Alexandrov and Nikola Stoyanov, the funds required for its construction are available from Haskovo public. On September 8, 2003. the feast of Nativity of the Virgin was inaugurated and consecrated by Bishop Arseny with a ceremony on this date fair is celebrated the feast of the town since 1993. The villagers expressed their love, honor and faith to his protector, the gratitude of the population dates back millennia, preserved traditions and values ​​are transmitted from generation to generation. A year after unveiling of the monument opened the chapel, which became a magnet for residents and guests. Above the massive gate of the chapel was placed a large Christian cross and a marble mosaic remarkable radiating love. 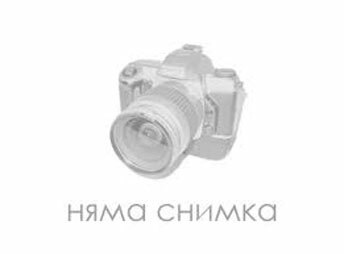 Included in the list of hundred tourist sites. Recently, in 2010, again entirely from donations is magnificent Bell Tower, it stands proud monument to the "Virgin Mary with Child" and adds clear the sound of eight bells of different sizes echoed the city's height and reach thirty meters and is made one of the highest on the Balkan Peninsula. Numerous steps lead up the hill, where the monumental composition, hence is found delightful panoramic views over the city and the magnificent scenery in the area. There are several evocative churches, in "St. Dimitar" is the only place in town Sunday school, where he studied Orthodox values. Stands is glamorous gilded dome of the basilica "St. Archangel Michael" church of God or the Greek Church as called, differs icons with Greek inscriptions, carved iconostasis is ornate, paintings are beautiful works of art, declared a monument of culture. The oldest church is the "Assumption" built on the site of an ancient chapel even during the Ottoman rule and to protect is protected by four meters high stone wall. In the field is a unique Christian monument, the rock church in the village Mihalich, it is a cultural monument of national importance and is the only trihonkalna form is carved in the rocks, carved stone steps lead down to the inside with a stone altar and crosses outlined in the walls. Land of Haskovo has preserved precious historical and cultural monuments are found a number of cultural sites, temples, tombs and medieval castles. We can visit the magnificent houses and museums, architectural masterpieces with exquisite carvings and revival. For lovers of art art work art gallery. Starata prikazka za prostia narod i slabata darjava. Sled kato niamat kakvo da iadat, pla4at ot niski pensii i zaplati- 4akat ot bogorodica. Pla4e mi se za tozi narod i darjava. Narod liu6kan ot edna utopia v dryga. Koi e vidial bogorodica, 4e i gospod? E , xaskovlii 6te 4akat da im se poiaviat. Ina4e- mladite slu6at 4alga i nemogat da pi6at balgarski ezik/ne priemam zabelejki, 4e ne pi6a na kirilica- niamam, no cenia dalboko pametta na cvetlite bratia. Za6to ne napravixa pametnik na tiax? Jalko, jalak narod- izglypial do bezobrazie. S parite 6tiaxte da podobrite sastoianeto na niakoia bolnica, gospoda. A , ina4e--- sigyrno... viarvate v neporo4noto za4atie, ta pravite pametnici ot tozi rod.